Do you see those creepy red eyes peering at us from the bushes? Could it be...the phantom? This Kids Phantom Costume is a scary costume for kids that really lights up! Just pick up three AA batteries and the two red glowing circles will appear on the mask. Kids will love the cool special effects that this costume offers. Pick up a reaper sickle for the complete look. Death can be a friggen terrifying idea, but it all comes out of the fear of the unknown. Since nobody knows what death really looks like, none of us are quite sure what to expect. And, the drawings that we’ve put together from various cultures throughout the world doesn’t make the idea any more inviting. Of course, we’ve also been taught all our lives not to judge a book by its cover. Perhaps the floating haunt and skeletal face and casual ownership of a massive harvesting scythe and the dark, grim, black robes that seem to wither the wind is only Death at skeletal face value. Maybe we just need to get to know Death a little better before we start freaking out! Of course, that provokes an interesting question. What of the Deaths of other creatures? Is there a Dog Death? A little black lab in a floating shroud that carries an ancient rawhide in its mouth? Or, since we brought up a rather tragic concept, what about a Child Death? Surely such an entity would have a calmer appearance to handle such a delicate situation, right? Well, turns out that kids just aren’t afraid of that much and you can prove that with this Kid’s Phantom costume. 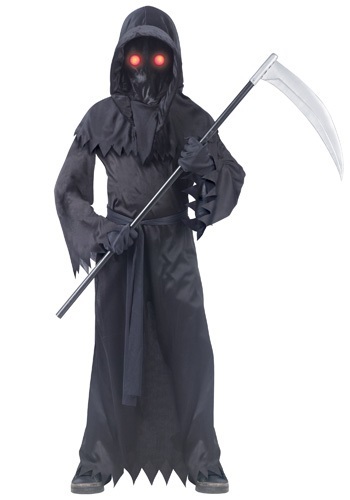 Death takes an unexpected and horrific turn with this back-tied fabric robe with jagged hemline and cuffs. It cinches at the waist with a matching sash of dark black. The real marker is the padded hood and the mesh face covering that prevents (or helps) us from seeing the true face of death. Unfortunately, after a few AA batteries, we instead get to see Death’s glowing red eyes. Well, there goes any idea that a Death Phantom tyke might be a bit more approachable! Finish that idea off for good with any number of accessories, including a scythe or hourglass pendant and remind everyone that Death comes for all!